Who’s Minding the Store? Paramount Pictures 1963. What attracts me to this movie is the names. Jerry Lewis, Ray Walston, Agnes Moorehead, and Frank Tashlin (whom I know as a golden age Warner Bros. cartoon director). It occurs to me I haven’t seen any of Ray Walson’s work from before the 90s. Sometime I should track down My Favorite Martian. I’m realizing now that I’ve chosen another movie that will probably be light on plot. The focus will likely be on getting Jerry Lewis’s character into situations where he can do physical comedy routines. However, it won’t be as tightly fixed on that as a film from the era of Buster Keaton. Barbara Tuttle is heiress to the Tuttle department store empire, but wanted nothing to do with the rich and powerful life her mother lives and wants for her, so she moved out of her parents’ house, changed her name, got a job as the elevator girl at the nearest Tuttle’s, and started dating Norman Pheiffier, a sincere but klutzy man who can’t keep a job. Unable to accept such a man for her daughter, Mrs. Tuttle schemes to break them up by having the store hire Norman and set him doing all the worst, most humiliating, most impossible jobs Mr. Quimby the manager can think of. And Norman steadfastly rises to the challenge, because he’s saving up money to marry Barbara, assuming he can stay in the job long enough. The plot really does seem to wander. Mr. Quimby seems set up for a larger involvement through the middle than occasionally coming around to watch what he set up earlier, and Mr. Tuttle the hen-pecked figurehead president of Tuttle’s has a lot more story than he’s given. Norman gives him a golf lesson and tells him that a man ought to be the king of his home, and then Mr. Tuttle disappears and reappears an act later having so much taken what Norman said to heart that he stands up to his wife in what turns out to be only a very mild victory 20 minutes before the end. Additionally, in order to wrap up quickly, Mrs. Tuttle seems to have a change of heart off-camera, judging by her confusing appearance in the last scene. Perhaps Mr. Tuttle just ordered her into it with his newfound backbone, but whatever it was, we didn’t see it. 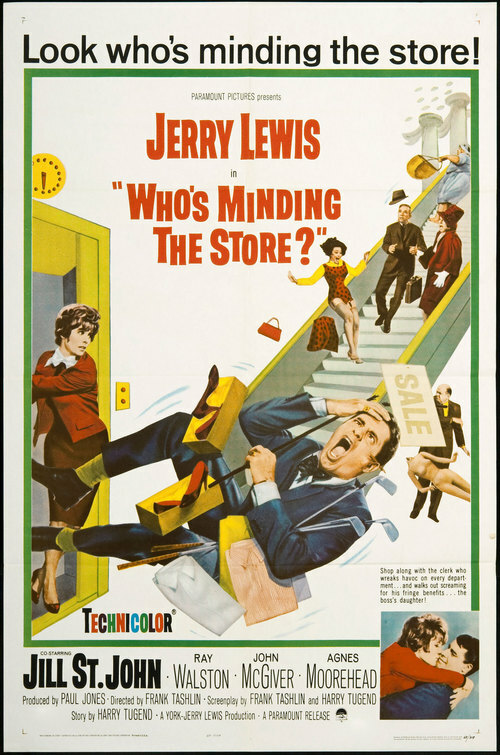 Of course, the intended star of this movie is the physical gags that the actual star, Jerry Lewis, gets into. My favorite is probably the scene with the electronic golf set, which introduces the recurring victim of the traffic cop outside by having the loose golf ball bounce on his head an improbable number of times. Perhaps my least favorite is Norman firing the elephant gun and getting knocked back across the entire floor of the store, because that’s all it is, just a long, long, long sequence of Norman flying backward causing more and more destruction. Also notable is Norman trying to escape from Barbara’s urging to go to bed together right then. It’s still the relatively clean-cut early part of the 60s, but a sign of changing attitudes. I don’t think that would have made it into the movie in the 40s or 50s. Watch this movie: if you can avoid slipping on a banana peel on the way to the couch. Don’t watch this movie: for well-developed characters.